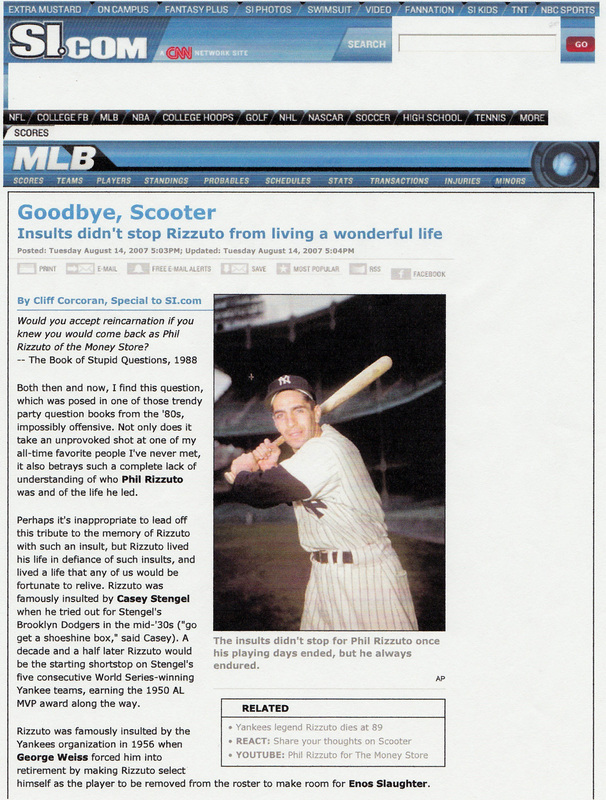 My first opportunity to break out of the Fungoes box with SI.com came with the news of Phil Rizzuto’s death on August 14, 2007. Though I had already been writing the Wild Card entry in the Fungoes blog for SI for five months at that point, I still think of this as my first proper SI.com piece, not because of the quality of the content, but because it was the first time my work for the site appeared on the standard SI.com template (see image below for a reminder of what the site looked like back then) and was rewarded with a proper freelance fee (we were paid for Fungoes, of course, but a relative pittance). Looking back at it now, it’s not a particularly strong piece, but it established my ability to provide quality work quickly on deadline in reaction to breaking news and likely did more to create my subsequent opportunities at SI.com than the previous four and a half months of Fungoes pieces combined. The piece has since vanished from the interwebs along with most of my other SI pieces from that year, but I’m republishing it below exactly as it appeared on SI.com in August 2007, warts and all. Both then and now, I find the question, which was posed in one of those trendy party question books from the ’80s, impossibly offensive. Not only does it take an unprovoked shot at one of my all-time favorite people I’ve never met, it also betrays such a complete lack of understanding of who Phil Rizzuto was and of the life he led. Perhaps it’s inappropriate to lead off this tribute to the memory of Rizzuto with such an insult, but Rizzuto lived his life in defiance of such insults, and lived a life any one of us would be fortunate to relive. Rizzuto was famously insulted by Casey Stengel when he tried out for Stengel’s Brooklyn Dodgers in the mid-’30s (“go get a shoeshine box,” said Casey). A decade and a half later Rizzuto would be the starting shortstop on Stengel’s five consecutive World Series-winning Yankee teams, earning the 1950 AL MVP along the way. Rizzuto was famously insulted by the Yankees organization in 1956 when George Weiss forced him into retirement by making Rizzuto select himself as the player to be removed from the roster to make room for Enos Slaughter. Weiss was slaughtered in the press for the move and the team’s broadcast sponsor insisted that Rizzuto be hired to broadcast the team’s games the following season. Rizzuto was still in the same job 39 years later when the team forced him to call a game rather than attend Mickey Mantle’s funeral. Rizzuto, enraged and embarrassed, quit mid-game, but public outcry brought him back for a 40th and final season. My voice was one of those calling Rizzuto back. The Scooter may have had more to do with my becoming a baseball fan than anyone else. Though my family is filled with Yankees fans dating back to the days of Babe Ruth, I had no older sibling to turn me on to baseball and neither of my parents was particularly interested in professional sports when I was growing up. Instead it was Rizzuto, with his enthusiasm, good humor and wildly entertaining and unpredictable asides (which were a good match for the often tragicomic play of the mid-’80s Yankees), who sold me on the joys of the game and its history despite the poor quality of the team I was watching. Even then I was aware of the slights Rizzuto had endured. In 1984 Pee-Wee Reese was selected to the Hall of Fame by the Veterans Committee, leaving Rizzuto on the outside looking in at his former crosstown rival. A decade later Rizzuto was finally inducted as well, only to have Bill James devote a large portion of his book The Politics of Glory to bemoaning Rizzuto’s selection. Though James ends his book by stating clearly that Rizzuto was “certainly not the worst player to stand on that podium,” many glossed over that line and dubbed Rizzuto precisely that (including the charming fellow who sponsors Rizzuto’s page on basebaballreference.com). It’s true that Rizzuto was inducted ahead of many far more deserving players, many of whom continue to await their day in Cooperstown, and that his induction has as much to do with a well-stocked veterans committee, led by Ted Williams (who often said that Rizzuto was the difference between the Yankees and Red Sox in the late ‘40s and early ‘50s). It’s also true that Rizzuto is far from the worst player in the Hall. Just look at the list of old cronies Frankie Frisch and Bill Terry helped through the door via the Veterans Committee in the early 1970s. The fact remains that, whereas Terry and Frisch were lining up former teammates, Rizzuto was inducted because the greats of the game, Williams and Ty Cobb among them, thought he deserved to be listed as one of their equals. Unlike Williams or Cobb, Rizzuto was a hard man not to like. Though he held a grudge against Stengel’s shoeshine box comment throughout his life, and retired from broadcasting over Mantle funeral incident, I’ve never seen nor heard an unflattering word about the man. Whether you marveled at his wizardry in the field as a fan, cursed his pesky presence in the batters box or on the bases, laughed with him or at him while listening to a Yankees broadcast, or only knew him as the (reportedly unwittingly) double-entendre-spouting play-by-play announcer in the middle of Meat Loaf’s Paradise by the Dashboard Light, he brought good spirit to and evoked admiration from all those whose lives were touched by his. It wasn’t such a bad thing to be Phil Rizzuto, Hall of Famer, seven-time World Series champ, MVP, All-Star, a man who spent a half-century in baseball interrupted only by his naval service during World War II. It’s no wonder Rizzuto endured all of those slights with such good humor. Beyond his accomplishments on the field and in the booth, Rizzuto enjoyed more than 60 years of marriage to his beautiful bride Cora (who was a frequent character in his broadcast banter), and is survived by three children and two grandchildren. We should all be so lucky to live the life Phil Rizzuto lived, but we are already very fortunate that he lived it. Rest in peace, Scooter. Cliff Corcoran is the co-author of Bronx Banter. The following are a selection of links to articles I’ve written that look back at baseball history and the lives of the men who participated in it. This is an active post, the list below is by no means complete, and links may be added as I remember/stumble upon other such pieces. Last updated April 19, 2015.